Mojo Disposable Vape Pods are the perfect item for the on-the-go vaper who doesn’t have the time to worry about charging batteries or refilling their pod. With Mojo, all you have to do is unwrap it from the packaging, pull out the mouthpiece stopper and boom you’re ready to start your vaping experience. With the amazing flavors that Mojo vape creates, you will always be able to find a flavor that drives you wild. Mojo Cool Melon brings you the delightful taste of sweet honeydew that will have your mouth watering in seconds paired with a cooling menthol base that will drive your taste buds crazy. As you inhale Mojo Cool Melon, the taste of fresh honeydew will hit your taste buds in the best possible way. As you exhale, the menthol base will cool and refresh your taste buds in the best possible way. With Mojo Cool Melon you will feel on top of the world with every puff you take. 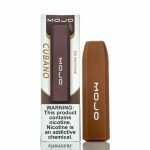 Mojo Cubano is the best Cuban tobacco flavor on the market. This rich and hearty flavor will have your taste buds in a frenzy from your very first puff until your last. 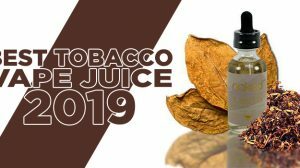 As you inhale Mojo Cubano, the taste of Cuban tobacco will dance across your taste buds in the most tantalizing way that will surely drive you crazy. As you exhale, the flavor subsides slightly leaving your taste buds buzzing and craving more and more. This flavor is so accurate that with every puff you take you will feel like screaming from the rooftops about how amazing it is. Mojo Tobacco is the perfect flavor for those of you quitting smoking but can’t get rid of those tobacco cravings. With Mojo Tobacco your taste buds will be blanketed with the taste of tobacco that is as rich and as earthy as can be. This pod flavor has just the right amount of underlying sweetness that will surely drive you crazy. As you inhale Mojo Tobacco, the taste of earthy rich tobacco will hit your taste buds in the best possible way. As you exhale, the flavor lingers behind just enough to keep you wanting more and more. 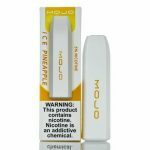 Mojo Pineapple Ice is the perfect blend of tangy and cooling menthol that will surely drive your taste buds into a frenzy with every single puff you take. This flavor has just the right amount of sweet and citrus pineapple to have your taste buds tingling all day long. As you inhale Mojo Pineapple Ice, the taste of pineapple will tingle across all of your taste buds in the most scrumptious way. As you exhale, the menthol base will soothe your taste buds in the best possible way. Mojo Lemon Cake is the perfect dessert flavor that will have your taste buds in a state of heaven. 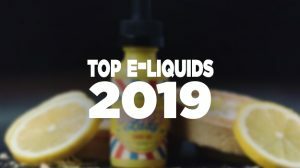 With every puff of this mouthwatering vape juice, you will feel like you’ve just walked into your favorite bakery and ordered a freshly baked lemon loaf. As you inhale Mojo Lemon Cake, the taste of fluffy yellow cake will hit your taste buds in the most succulent way. As you exhale, the lemon zest flavor will combine with the yellow cake to create the best lemon loaf flavor you’ve ever tasted. 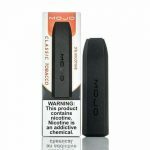 Mojo Menthol is the perfect vape pod for you menthol fanatics out there. This pod has just the right amount of minty spearmint to have your taste buds going wild. With each puff of this mouthwatering vape juice, you will feel as if you are indulging on your favorite piece of gum. As you inhale Mojo Menthol, the taste of spearmint will hit your taste buds will all of its icy goodness. As you exhale, the mint flavor subsides slightly leaving your taste buds calling out for more and more. Mojo Peach brings you the delightful taste of sweet southern peaches that will drive your taste buds up a wall from your first inhale until your very last. This vape juice is perfect for those of you with a sweet tooth you can’t seem to kick. 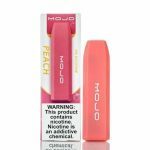 As you inhale Mojo Peach, the taste of southern peaches will hit your taste buds in the most succulent way. As you exhale, the sweetness lingers just enough to have your taste buds jonesing for another puff time and time again. Mojo Strawberry provides you the taste of perfectly ripened strawberries year around so you will no longer have to wait for strawberry season to come around. This flavor is so on point that you will feel as happy as can be with every puff you take. As you inhale Mojo Strawberry, the taste of freshly harvested strawberries will wash over your taste buds in the most mouthwatering way. As you exhale, the strawberry flavor will linger in such a way that you will always have that delightful taste on your taste buds. 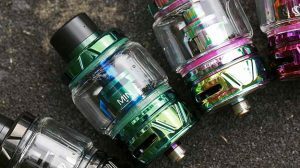 Mojo Disposable Vape Pods are the newest up and comping vape trend that will quickly take the vaping world by storm. What’s fascinating about these disposable pods is the ease of use, providing incredible convenience for the user. Simply vape your favorite Mojo flavor and forget it! 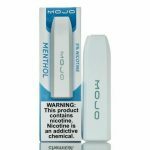 This Mojo Disposable Vape Review is a brilliant piece that allows you to discover such an awesome brand, which features tons of flavored disposable pods that perform extremely well. If you’re looking for something to use while traveling, on-the-go, or just want a device that you can use and toss in the trash without the hassle of e-liquid refills, battery recharges and everything else that comes along with vaping, you will love the Mojo disposable. There are several flavors to choose from that will charge your taste buds and leave you satisfied with ease. 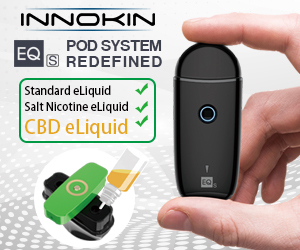 With many devices on the market, especially the all-in-one pod market, the choices are endless. 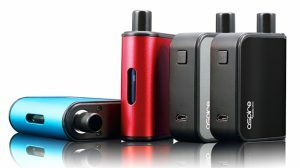 However, Mojo thought it would be a great idea to focus on a device that’s more convenient and could work as the best option for those who are more mobile and wanted the same great vaping experience without the hassle that’s associated with it. Fortunately, their idea paid off big and has become a huge success within the industry. Ultimately, Mojo offers a modern disposable vape pod system. For those that didn’t know, disposable e-cigarettes were the big thing half a decade ago, and somehow this brand has brought it all back with the new Mojo Disposable Vape.